"but I mean, it was not like we couldn't visit her. She- she let us know that we was welcome at any time we wanted to. We just had to pick the phone up and arrange it." Reporter: Did you all ever meet with her or go up there? Reporter: But, at some time you have to- as the adoptive parents, make a decision that it's okay for her to stay with Nan. Casey Parsons: We did that in February. We let her know it was okay. We trusted Nan fully. I mean, I trusted Nan with even my other kids, not just Erica, if that was the case. If she- I needed her for that. Uh, Nan was just a lady that- she was sweet. And Erica always had good to talk- in September, when she come back, November- Erica loved this lady with her whole heart. She loved her to death. Casey Parsons: Well, we pretty much gave Nan the permission to do that when she talked to us that last time. She knew it. She knew that I had no problem with her staying up there at all. 'Cause they had been discussing even purchases of cars even a year away when she got her driver's permit and her license. We- I guess you could say we had a mutual agreement. She was going to stay there, but I mean, it was not like we couldn't visit her. She- she let us know that we was welcome at any time we wanted to. We just had to pick the phone up and arrange it. Casey Parsons didn't know "Nans" address but they gave full approval for Erica to stay living there with "Nan." Casey Parsons said "Nan" invited her whole family, including their parents to the bowling alley birthday party. Casey Parsons then said "they" called and said Erica didn't want Casey and her family to come to the birthday party but yet Erica wanted to stay at "Nans." Casey Parsons: "Yeah, we talked to her over the phone when she was gone and everything- all three times. But, then in December it was a three week- that's the longest she'd been gone was the three week one. And then, of course- about, it wasn't right to the very dead end of three weeks. They called and she just wanted to extend the stay and we agreed on that after a little bit of talk. Then her birthday come up and it come up to her birthday and they wanted to extend that and we was gonna go to a birthday party up there and Nan was going to bring her to a bowling alley. And, my whole family was invited. My parents, all of us. 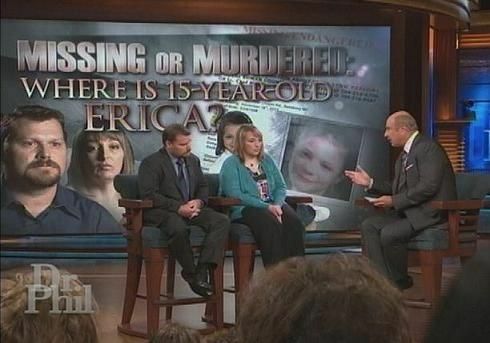 And then, it was about a week before her birthday when they called to let me know that Erica- I knew that didn't come back was going to come up anyway- I was just wondering when it was going to finally be asked cause it was hinting around longer. Stay a little bit longer, stay a little bit longer." Casey Parsons: Well, about a week after the conversation about the not coming to the birthday party, Erica did not want us at her birthday party. And, that was the whole same conversation about her staying there. Um, we was very hurt then but, we- I called about, I would say probably about a week later and several other times too because I didn't know if it was just her phone got disconnected from nonpayment- it would only say it was not receiving phone calls at this time. So..
Reporter: Did you have an address? Casey Parsons: No. I didn't. "Erica was, had a very big learning disability and she said that she thought it would be better for Erica to have a tutor anyway than be put in public school." --- . 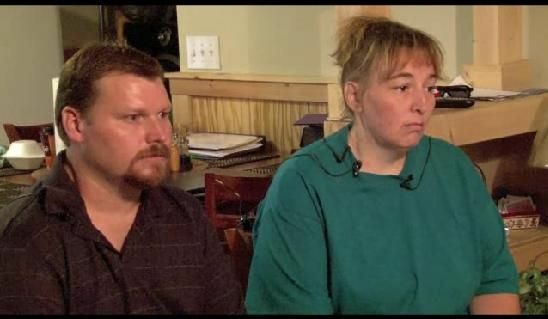 Casey Parsons: That was in February when she mentioned, because we asked about her schooling, and Erica was, had a very big learning disability and she said that she thought it would be better for Erica to have a tutor anyway than be put in public school. Dr. Phil: So you had no idea who was teaching, just some neighbor of the woman. Casey Parsons: She said she was a teacher. Dr. Phil: That you met at McDonalds. Casey Parsons: She said she was a teacher, that she's known her for years. 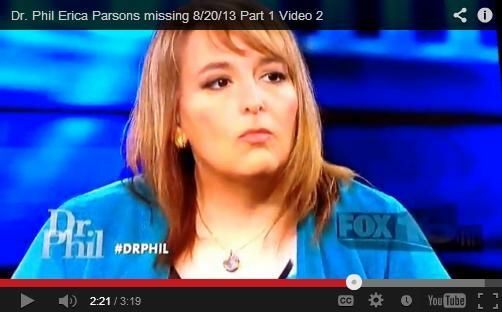 Dr. Phil: Does that seem negligent in retrospect? Casey Parsons: Not to me, not to me. Dr. Phil: I know at the time you look one way but afterwards you look at it another way. Casey Parsons: Not to me. And the phone, it was saying it can not accept calls. I honestly figured the phone, Erica had blocked it and would not let me call her. 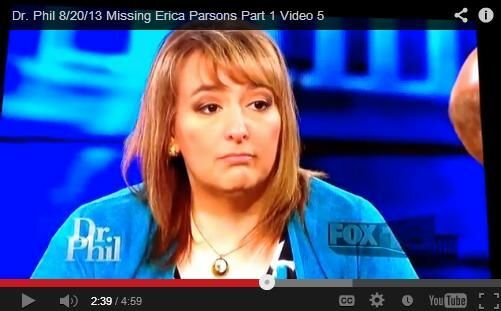 Dr. Phil: But it rolls around her birthday, did you call and wish her Happy Birthday? Casey Parsons: And the phone, it was saying it can not accept calls. I honestly figured the phone, Erica had blocked it and would not let me call her. Because I was just under the impression Erica didn't want to come back home. And she was going to do what took me to (not audible). Dr. Phil: But that's the reason children don't make decisions. That's the reason adults make decisions. This is your child. Casey Parsons: This is not a little kid, this was a 14 year old girl at this time. hello no net at home yet but back on the road anyone know where work is let me know .